Our country house is located on Garvin Mesa within 7 minutes of the town of Paonia. The home is surrounded by many trees and running water making it feel like an oasis. It has two private, comfortable bedrooms, one with a king bed and the other has a queen bed. The contemporary bathroom has a walk-in shower. The full kitchen is well equipped with everything you'll need for food preparation. Outside, you'll find a cooling effect from all the trees blowing in the breeze and water flowing through the streams. For your outdoor relaxation, there are plenty of places to slow down and relax including comfortable chairs and benches. A large area of lawn surrounds the house to help cool things down with the West Elk Mountains providing the perfect backdrop to complete the scene. One of the outbuildings adjacent to the house once housed the first location of KVNF, Paonia's Community Radio station (1979). The Paonia area is a great place to bring your bicycles and tour around town or down some of the country lanes. There are many local hiking trails available as well. The end of September brings the annual Mountain Harvest Festival held in the Paonia Park. This festival features music and other entertainment as well as offering local produce and crafts. 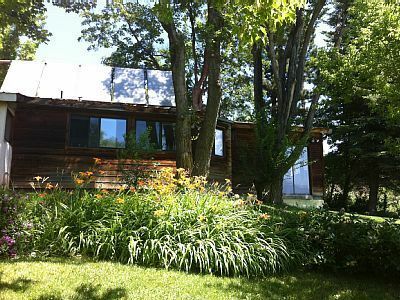 The property is located within easy walking distance of the Stone Cottage Winery. Two others, Terror Creek Vineyards and Azura Winery, are a very short drive from the home. There are many other wineries and vineyards scattered throughout the North Fork Valley easily accessible by car. Day trips from the house to places like Crested Butte, Grand Mesa or the Black Canyon National Park are entirely possible. Our place, on Garvin Mesa northeast of Paonia, is located on a former orchard and pasture land. The West Elk Mountains featuring Landsend Peak, Mount Lamborn and Coal Mountain provide a beautiful backdrop for your stay. In good snow years, there can still be snow on the mountains into July. Electric baseboard heat in Master bedroom and bathroom. Portable space heaters available for other areas if needed. No local service but VHS and DVD players are available. Entertainment room with flat screen television, blue-ray DVD player. Table and chairs for cards and games. A variety of board games, etc. This place was nice and easy. Everything we needed to relax and enjoy the peace and quiet. The house is full of art and character with cozy beds and comfortable furniture. Town close by to get beautiful fruits, veggies and wine to cook and enjoy the view of mountains through the fall colors of the yard's trees. A little stroll down to the lavendar garden where you are greeted by the neighborhood's wild turkeys. Deer and lots of good yard birds. Definitely a five star experience. My wife and I loved this place. I booked it based on reviews and location without knowing much about the area. Spent three nights in July. Everything about the property was better than pictured or imagined. The house was clean, comfortable and decorated and furnished with quality items that one would place in their own home. Truly wonderful grounds with lavender field and fruit trees not to mention the beautiful views of the mountain. It was the place to unwind and relax after days hiking throughout Colorado. A couple of wineries are very close - Azura and Stone Cottage Cellars both are very good for different reasons. In Paonia we had a couple of good meals at the Living Farm Cafe where the service was as good as the food and good burgers at Delicious Orchards. The best part was the house and property - loved getting up to a view of the mountains and having coffee outside wandering the property and saying "Morning" to the turkeys that came every day. Campbell and Susan, you truly have an oasis. Thank you for letting us stop and rest on our travels. The house was very spacious, inviting and clean. The owners were incredibly welcoming and kind. The property is beautiful with the best views of the valley we could ever ask for. The wineries close by are very high quality. Paonia was hopping with plenty to keep us as busy as we wanted to be. We wish we could have stayed longer! We had an amazing relaxing weekend! We really enjoyed the amazing fall colors, the house set up and the nearby wineries! Thank you for a great weekend! Such a quiet, peaceful property! Such a wonderful place to stay for a long weekend and visit the area of Paonia. We loved being able to just walk down the gravel road to the Stone Cottage Cellars where we were attending their winemakers dinner. We sat outside at night on the patio and it was so quiet!! I live in the mountains in Evergreen, CO and I thought it was so peaceful there! This place was even better. Both the queen and king beds were very comfortable. The kitchen was well equipped except we would suggest that they add some inexpensive wine glasses for their guests to use seeing how they are situated in a wine region. Other than that, no complaints here! Thank you, Stanton's for letting us stay at your home!